BRIGHTON, Mich.- The bold styling of the all new 2013 Ford Edge will captivate your attention with its striking front grille and sleek aerodynamic lines. And that commanding style is seamlessly carried over to the interior of the new Edge, with every detail accounted for including best-in-class second-row leg room. But your Ford Dealership serving Washtenaw County brings you a 2013 Ford Edge Features Review to focus on the captivating new aspects of the latest generation Ford Edge that will get you noticed! First off, the Ford Edge Panoramic Vista Roof, bringing the delightful sunroof experience to all passengers in the vehicle. Enjoy the great outdoors by fully opening the front panel and enjoying the views from the fixed-rear skylight. Set the mood with Ambient Lighting, a 2013 Ford Edge Feature on the Limited and Sport models. Choose from 7 programmable colors to illuminate various areas in the vehicle. 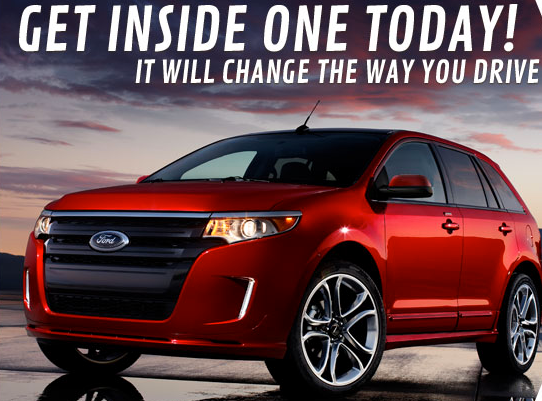 Reviewing the 2013 Ford Edge Features, you'll find endless design options to choose from. Select the SEL Appearance Package for a little more style, or personalize your wheels from the 6 available rim-options, and command attention with the longer lasting HID Headlamps on the Limited model. Last but definitely not least, functionality is important in the 2013 Ford Edge Features Review. The Power Liftgate makes your life easier by opening/closing the liftgate with just the touch of a button. With so many available options, personalize the perfect Ford Edge for your needs with our Build & Price Tool. Brighton Ford can also save you money on the purchase of your next crossover with our Ford Edge Rebates and Ford Edge A Plan Pricing. For older models, check out our Used Ford Cars in Brighton, MI. Brighton Ford is located at 8240 Grand River Ave. just north of I-96 in Brighton. We are a family owned and operated business that strives on customer satisfaction. For more information on Brighton Ford visit www.BrightonFord.com or give us a call at (800)-836-8206. Your blog about Ford cars is informative. It has many nice features , good mileage, high quality driving etc .People love Ford . Ford is being improved as well as customer are getting various model Ford Falcon BA series day by day . My ford looks nice and we really enjoy by driving this car.